Renowned for her extravagance and the splendour and lavishness of her court, it’s not surprising Marie-Antoinette had a great love for pearls and diamonds. It was reported that as the royal family prepared their escape from France the queen spent an entire evening in the Tuileries Palace wrapping her diamonds, rubies and pearls in cotton and placing them in a wooden chest. In the following days, the jewels were sent to Brussels, which was under the rule of the queen’s sister, Archduchess Marie-Christine and was also home to Count Mercy Argentau, the former Austrian Ambassador to Paris, who was one of the only men who had retained the queen’s trust. He who took delivery of the jewels and sent them on to Vienna were they were placed in the safe keeping of the Austrian Emperor, Marie Antoinette’s nephew. After the Revolution, the king and queen’s only surviving child, Marie-Thérèse de France (1778-1851), “Madame Royale”, travelled to Vienna and took possession of the jewels. On her death, Marie-Thérèse bequeathed part of her jewellery collection to, Louise of France (1819–1864), who was her niece and adopted daughter (1757-1836), who in turn left them to her son, Robert I (1848-1907), the last ruling Duke of Parma. Some of these jewels are now coming up at auction at Sotheby’s on November 12, including a diamond pendant (est. $1‑2 million) supporting a natural pearl of exceptional size (26 mm x 18 mm), along with a pair of natural pearl drops (est. $30,000‑50,000) and a grand necklace featuring 331 natural pearls (est. $200,000‑300,000). 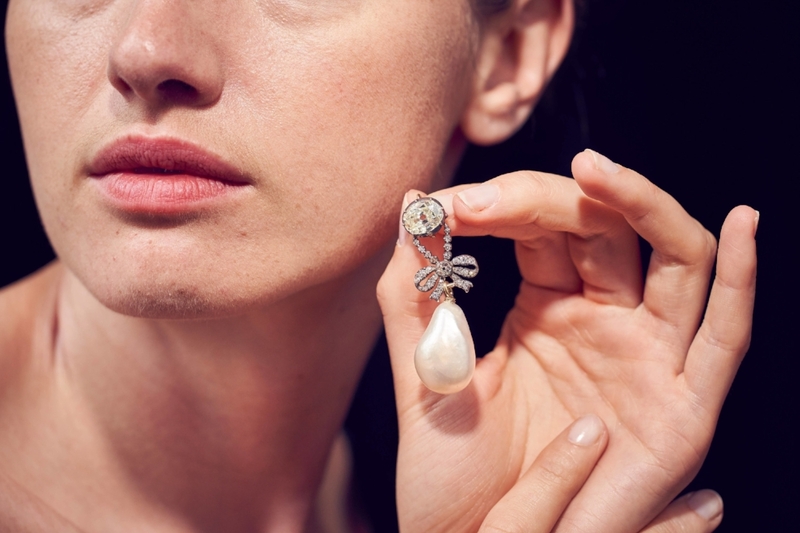 The pieces are part of a larger consignment of jewels from the Bourbon-Parma family, which due to the family’s links to the most important ruling families of Europe makes this “one of the most important royal jewellery collections ever to appear on the market” according to Daniela Mascetti, Deputy Chairman, Sotheby’s Jewellery Europe and Senior International Specialist. The collection features a breath-taking diamond parure composed of 95 diamonds (est. $300,000‑500,000) which was made for Louise of France and includes five solitaire diamonds that belonged to Marie-Antoinette, several stones that adorned the sword of the Duke of Berry, son of Charles X and father of Louise (assassinated by an anti-royal Bonapartist in 1820) and a large pear-shaped diamond from the collection of the Archduchess Isabella of Austria, Princess of Croÿ (1856‑1931). Other highlights include a diamond tiara of foliate scroll design given by Emperor Franz Joseph (1830‑1916) to his great-niece, Archduchess Maria Anna of Austria for her wedding to Elias of Bourbon, Duke of Parma) in 1902 (est. $80,000‑120,000), as well as a diamond bow brooch, adorned with a 6.89-carat Burmese ruby (est. $200,000‑300,000) and a diamond ring set with an impressive fancy orangey-pink diamond of 2.44 carats (est. $120,000‑180,000) given to Archduchess Maria Anna of Austria by her father to mark the births of her two sons.